Features a wood grain plastic grip, die-cast metal construction, and paper roll cap support (Not Included). 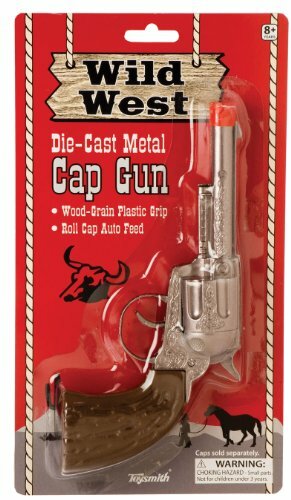 Go back in time with this awesome cap gun. Remember the joy of playing Cops and Robbers with your friends outside on a hot summer day! Note: Requires paper roll caps, not included with cap gun. THIS ITEM CAN ONLY BE SENT TO THE UNITED STATES. NO INTERNATIONAL SHIPMENTS PERMITTED.